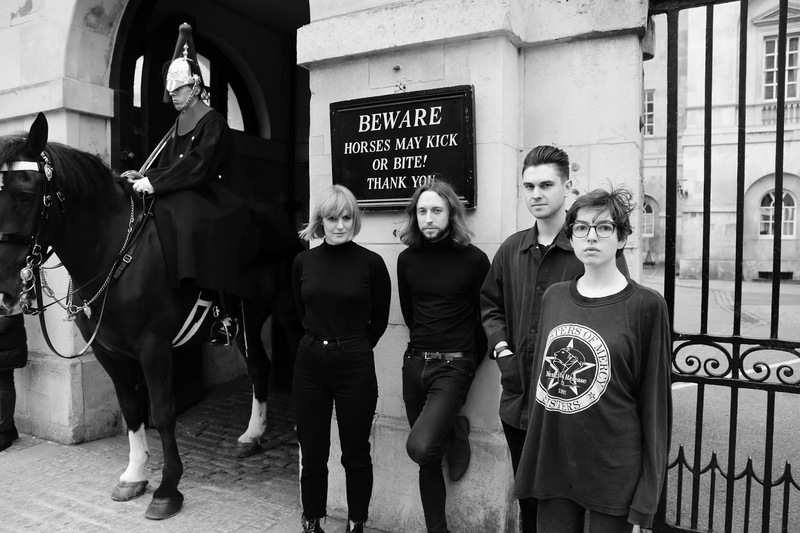 The Music Manual: INTERVIEW: Who are London four-piece Moderate Rebels? INTERVIEW: Who are London four-piece Moderate Rebels? LONDON'S secret underground just got a lot more interesting with foursome, Moderate Rebels. There's not much known about the band who very much like to keep their lives out of the spotlight and rely on the music to convey their real and deep-routed feelings. Following on from their debut single God Sent Us the four released a lo-fi masterpiece five-track EP Proxy via Everyday Life Recordings. Recorded in a small studio in South Bermondsey the EP embraces an anonymous society of wanting change in a peaceful but anarchic way - if that could ever be the case. This is mirrored in the EP - in the vocals, happy-go-lucky guitars and twanging strings with constant echoing spirits finding a way to whisper into the instrumental. Each of the five tracks offer a hypnotic euphony, which is showcased at gigs with extended 15-minute versions. The 'space age' is glorified in tracks such as Knight Time and rock in a way that Jarvis Cocker only knows how - perfectly scuzzed and out of this world in mind-numbing coolness. Hazy tracks such as Rename/Rebrand move into psychedelic territory but throw listeners into a deep hypnosis - a common theme throughout the EP. Well I suppose “who is” anyone? Moderate Rebels define themselves as a London based collective of various members who have come together to do this music. Not every member is involved in everything that Moderate Rebels do. It’s quite fluid, based on who is around and able, and so the work is the point. It’s not necessarily about the individuals involved. Your latest EP Proxy is one of a kind, do you think its hard to create music without an influence from other artists? We find it’s best to not think of this subject at all. You make what you make… analysis creates paralysis etc. Are the rumours true that you played one song for 30 minutes at a gig in London? Yes and it was very enjoyable - 30 minutes felt short if anything. Several members claim they forgot their names and got right out their skins during the performance, which is great. For people who are not familiar to you, how would you introduce yourselves? Is it important for you to keep yourselves private and just let the music speak? Yes. It misses the point if anyone starts talking about their favourite colours or taking pictures of the meals they eat, or indeed getting loudly offended about things that someone else said on social media. If Moderate Rebels made a cocktail, what would it contain? Nice question. It would have to be a “dirty martini”… a bit of a classic, with a serious kick. Where do Moderate Rebels like to meet? Wherever is handy and not too busy. We like to be alone in a crowd. There is an album, or at least a collection of 15 songs, on it’s way soon. That’s the real MR communication that we want to offer up… everything else is just noise.